I've left this story up because it illustrates the effects of Exercise Induced Collapse (EIC) in Labs and the importance of testing. Shadow has been living happily in a wonderful home with children, but no other dogs, for almost five years now and experiences few problems now that she has a home with fewer triggers for her attacks. Yardley Labs Beadle Gypsy Shadow ('03 NFC AFC Five Star General Patton x Seasides Hakuna Matata ***) is now 26 months old (born 9/20/2007). Like many of NFC Patton's pups, she has been a little slow to mature, but is now a beautiful and intelligent young dog. 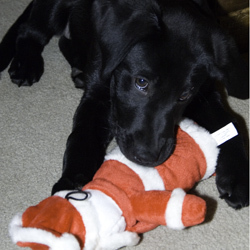 For the first 4-5 months, Shadow showed little retrieving desire but had infinite energy and loved to play. 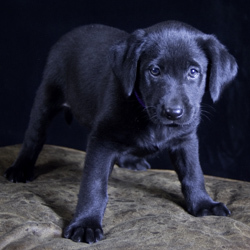 We had a litter of pups born when she was 9 weeks old, and Shadow adopted them as her own, trying hard to nurse them when they were three weeks old and she was only 11 weeks (Amazingly Sadie, the pups' mom, let all this happen.). At five months, the light went on and Shadow's pedigree began to shine through. This became apparent during some simple marking tests. Starting at 60 yards and moving out to 125 yards, Shadow kept driving straight to the bumper, paying no attention to the gunner. After a few retrieves we stopped while the gunner went out to place a blind for the older dogs at 350 yards. We didn't let Shadow go, but it was clear that she knew exactly where the blind was and wanted to fly to it. The following day we tried her on some more difficult and longer marks. In each case there was a shorter mark followed by a longer one with a tight angle forcing her to run close past the first mark to get to the second. In the first case the marks were at 150 and 250 yards. In the second they were at 125 and 300 yards. Shadow nailed every mark, never slowing down, curving, or looking to the gunner. Shadow remained in professional training for nine months. 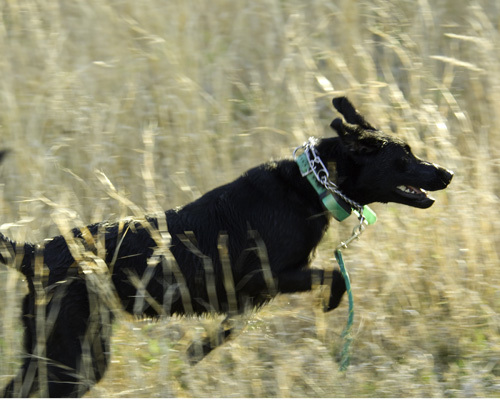 However, her future retrieving "career" ended a few months after she was diagnosed with Exercise Induced Collapse (EIC). Shadow will not be bred and will not be able to compete in field trials. She suffered her first EIC collapse when she was nine months old while playing "fun bumpers" with my other dogs. That remained her pattern for the next 6-7 months. 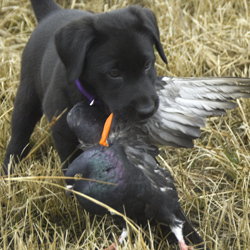 Subsequently, it became apparent that she cannot complete more than three long (200-300 yard) retrieves in sequence without showing signs of impending collapse. She is also affected by other situations of intense excitement. On a vet trip several months ago, there was a large number of dogs in the waiting room and Shadow wanted to play with each and every one. In the midst of the excitement, her rear legs became a little wobbly. I took her to a separate room and she settled down immediately. A few weeks later, (6/5/09) she passed the last leg of her Junior Hunter title. 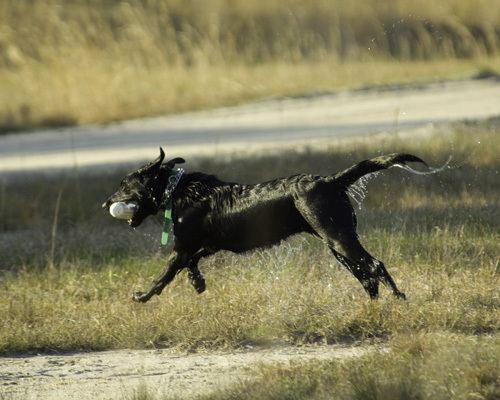 As expected, she had no trouble at all with the test; she is a retrieving machine whose joy is apparent in every step and leap. But the walk from the truck to the test and back again was long. We had to pass two other Master level tests. At every moment another shotgun shell fired and Shadow would look for the next bird, dragging hard on the leash. By the time we returned to the truck after her test, Shadow was wobbly again as I put her up to avoid a collapse. Since that time, Shadow has had no incidents. I no longer compete her and do not train her on multiple long marks in succession if there need to be corrections. In any normal activities, she has no problems and is now at an age where she is less and less excitable and less and less likely to be affected by EIC. As much as she loves training and retrieving, it is apparent that Shadow needs a quieter life than she now has: a home where she will receive plenty of exercise and love from a family that will enjoy the fact that she leaps 3-4 feet in the air just to tell you how wonderful the morning will be, and will give her tummy a rub when she crawls gently into your lap. The occasional waterfowl hunt would be great as long as she is watched for signs of problems. Of course, her talent is such that she might just retrieve a bird shot by that other hunter a quarter mile way if you miss too many shots. Shadow has a home with me for the rest of her life. However, I expect that I will eventually place her with a family that can offer her the life she needs since she cannot really live the life she was born for because of EIC. If you are interested in an extremely affectionate, energetic, house trained young Lab who is quiet in the house, obedient, and willing to show you just how beautiful the world looks through her eyes, please give me a call. She is a great retriever, a great house pet, an "aunt" to all of our little puppies, and loves all beings on two legs or four. If you are looking at possible puppies, I urge you to ask every breeder about whether or not they have tested the dogs for EIC. More information is provided concerning this test in the breeding philosophy section of this site. If the breeder does not know what you are talking about and/or cannot prove with a written report or OFA listing that at least one of the parents of their litter is is "EIC Clear", you should avoid working with that breeder. 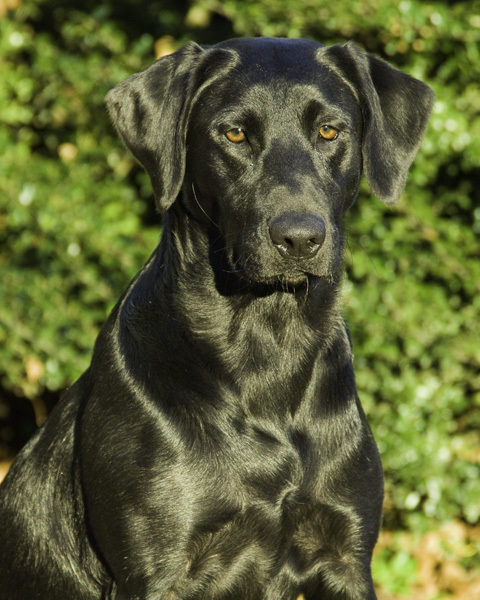 Of 30 dogs in Shadow's four generation pedigree, 25 are hunt titled or qualifieid all age, seven are national champions (with 14 national championships), and 19 are field champions. Click on her name above in red to see Shadow's five generation pedigree. CERF Eyes: Will not be tested, but can easily see birds fall 400 yards away.